Converting Standard Lid to Guide Type Lid? I've been planning to get a guide lid, but then had the thought of just modifying the standard lid that I have to be similar to a guide lid. 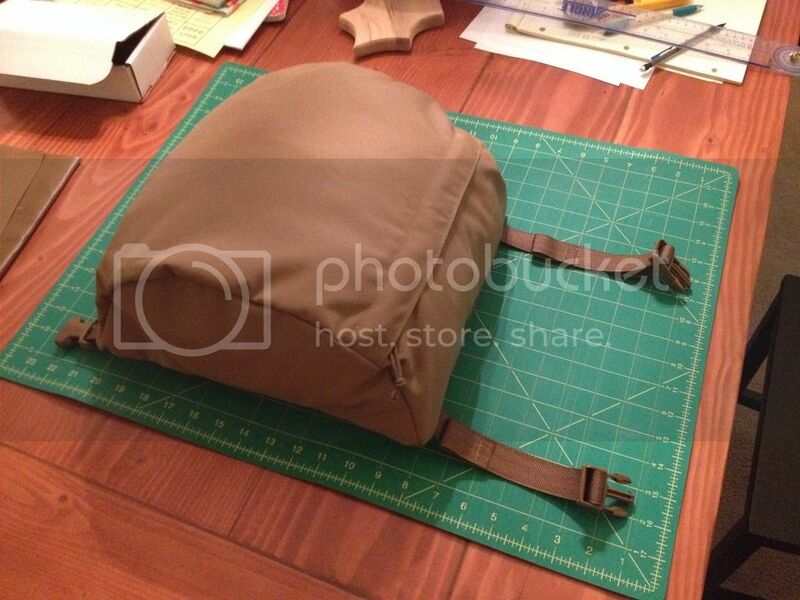 I'm thinking it would be pretty easy to add to the standard lid on the underside and just install a zipper. Has anyone done something along these lines to a lid before? If you have the ability to add on the bottom and add a zipper why not just make it from scratch cleanly, its only a tiny bit more sewing? Hey Pods, that's a good looking lid! I actually just got my zipper to do the same thing to my standard lid. The reason I want to mod it is that I really like how when empty, the standard lid comes down the side of the pack rather than just sit on top like the guide lid. I'm going to use some silnylon I have as the bottom, put 2 pleats in the corners so it expands within its footprint and place the zipper along the top of the lid. I want to be able to open it while the pack is standing up and things not fall out. pods8 - this is why I'd prefer to modify it. I know the guide lid is great, but I also prefer how the standard lid fits over the top of my pack, not just on top of it. I also would prefer fewer cubic inches. I know I could just build a custom guide lid that's not as big and fits more like the standard lid, but figured I'd try this out if it would be an easy mod. Making the bottom out of a durable stretch fabric might solve your dual use desire. Hadn't thought of that. That's a great idea. You thinking something like spandura? Stretchy material would be really nice! I've got some stuff called durastretch that I was envisioning but yeah same type of stuff. Figure it might be cleaner doing that versus the pleating that lam396 was talking about. Either way I think you might be better off making it from scratch versus cutting into the standard lid to get that zipper across the top, then you still have your standard lid if you ever want just that. Thanks for the advice. Yeah I'd definitely prefer the stretch over something pleated. I have to order fabric either way, so I'll probably try to make one from scratch that's smaller than the guide lid and shaped like the standard. Where did you source the durastretch? For me I'm still thinking a pleat or two (ithink it will help keep the material in place when not being used)but being able to add even more capacity or hold of shaped things is attractive. How much stretch does it have? I can't edit from my phone. It should say hold odd shaped things. wilderness outdoor fabrics, a good bit of stretch, I'd need to check at home but perhaps 2:1. Please keep us updated! I was just thinking about this!